See the radiograph depicting hyperparathyroidism below. Radiograph of the proximal tibia and fibula. Diffuse demineralization attributed to trabecular resorption is the most common plain radiographic sign of primary hyperparathyroidism. However, many surgeons believe that the initial 4-gland exploration enables a 95% cure rate with little morbidity and that initial preoperative localization provides no improvement in the outcome. Some surgeons advocate initial localization to guide directed dissection, obviating bilateral exploration. Opponents argue that the sensitivities of imaging modalities are not sufficient and that parathyroid glands can be missed in an unacceptable number of patients. The diagnosis of primary hyperparathyroidism is made by means of the laboratory confirmation of an elevated PTH level in the setting of hypercalcemia. 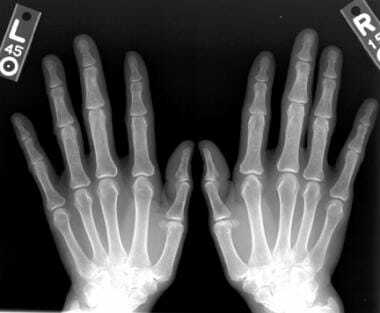 Bilateral anteroposterior (AP) radiographic views of the hands in a patient with multiple endocrine neoplasia syndrome type 1 (MEN 1) and primary hyperparathyroidism. These images show subperiosteal bone resorption along the radial aspects of the middle phalanges. Anteroposterior radiographic view of the right hand in a patient with multiple endocrine neoplasia syndrome type 1 (MEN 1) and primary hyperparathyroidism (same patient as in the previous image). 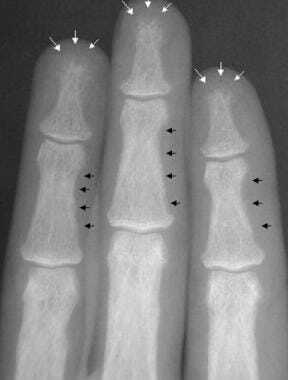 This image shows subperiosteal bone resorption along the radial aspects of the middle phalanges (arrows). Radiograph of the middle phalanges in a patient with primary hyperparathyroidism. This image demonstrates subperiosteal resorption that has resulted in severe tuftal resorption (white arrows). 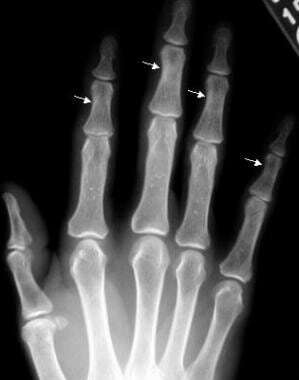 Also, note the subperiosteal and intracortical resorption of the middle phalanges (black arrows). Radiograph of the phalanges in a patient with primary hyperparathyroidism. This image demonstrates subperiosteal resorption that has resulted in severe tuftal resorption (arrows). If radiographs of the hands reveal no abnormalities, other sites are unlikely to demonstrate abnormal findings. Dual-energy x-ray absorptiometry (DXA) and quantitative CT (QCT) scanning may provide evidence of osteoporosis that is consistent with the diagnosis; however, the finding is nonspecific for primary hyperparathyroidism. Radiographs of the hand may yield the pathognomonic finding of subperiosteal resorption, which is consistent with a diagnosis of primary hyperparathyroidism. However, other findings on radiographs are not specific for this disorder. In addition, DXA and QCT scanning are the preferred diagnostic modalities for the evaluation of osteoporosis, which is one of the most common findings in patients with primary hyperparathyroidism. However, osteoporosis may be associated with a host of other diagnoses; therefore, the specificity of this condition may be limited. Currently, the diagnosis of primary hyperparathyroidism is primarily based on the laboratory confirmation of elevated PTH concentrations in the setting of an increased calcium level. For more information on hyperparathyroidism, see Hyperparathyroidism, Pediatric Hyperparathyroidism, and Imaging in Secondary Hyperparathyroidism. Initial evaluation should include 25-hydroxyvitamin D measurement, 24-hour urine calcium measurement, dual-energy x-ray absorptiometry, and supplementation for vitamin D deficiency. Parathyroidectomy is indicated for all symptomatic patients, should be considered for most asymptomatic patients, and is more cost-effective than observation or pharmacologic therapy. Cervical ultrasonography or other high-resolution imaging is recommended for operative planning. Patients with nonlocalizing imaging remain surgical candidates. Preoperative parathyroid biopsy should be avoided. Both focused, image-guided surgery (minimally invasive parathyroidectomy) and bilateral exploration are appropriate operations that achieve high cure rates. For minimally invasive parathyroidectomy, intraoperative parathyroid hormone monitoring via a reliable protocol is recommended. Minimally invasive parathyroidectomy is not routinely recommended for known or suspected multigland disease. Ex vivo aspiration of resected parathyroid tissue may be used to confirm parathyroid tissue intraoperatively. Clinically relevant thyroid disease should be assessed preoperatively and managed during parathyroidectomy. Devascularized normal parathyroid tissue should be autotransplanted. Patients should be observed postoperatively for hematoma, evaluated for hypocalcemia and symptoms of hypocalcemia, and followed up to assess for cure defined as eucalcemia at more than 6 months. Calcium supplementation may be indicated postoperatively. Familial pHPT, reoperative parathyroidectomy, and parathyroid carcinoma are challenging entities that require special consideration and expertise. Hyperparathyroidism is a disease of increased bone resorption and bone formation. 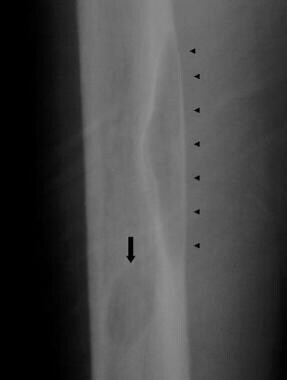 Subsequently, plain radiographic findings may include resorption and sclerosis of numerous sites in the skeletal system. Historically, osteitis fibrosa cystica was used to describe the advanced skeletal disease in primary hyperparathyroidism. Bone findings were characterized by the osteoclastic resorption of bone, osteoblastic bone formation, and fibrous replacement of marrow, with radiographic findings of subperiosteal resorption, brown tumors,  bone cysts, and sclerosis. These days, the most common radiologic finding in primary hyperparathyroidism is osteopenia, which may be generalized or asymmetric. Fine trabeculations are initially lost, with resultant coarse and thickened trabeculae. The disease may progress with further destruction that results in a ground-glass appearance in the trabeculae. About 30-50% of the bone density must be lost to show changes on radiographs. Other methods for the quantification of bone density, such as QCT scanning and DXA, are more sensitive in the evaluation of osteopenia. Additional findings include bone resorption, which may occur at many different anatomic sites. Bone resorption may be classified as subperiosteal, intracortical, trabecular, endosteal, subchondral, subligamentous, or subtendinous. Subperiosteal bone resorption is an early and virtually pathognomonic sign of hyperparathyroidism, and this finding is marked by marginal erosions with adjacent resorption of bone and sclerosis. An unusual lacelike appearance may be seen beneath the periosteum with an occasional spiculated external cortex. The underlying resorptive process may progress to complete cortical disappearance. 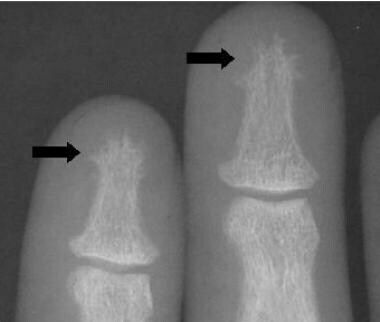 Although subperiosteal bone resorption can affect many sites, the most common site in hyperparathyroidism is the middle phalanges of the index and middle fingers, primarily on the radial aspect (see the images below). Other sites of subperiosteal resorption include the phalangeal tufts (acro-osteolysis), the lamina dura around the teeth, the medial aspect of the tibia, the humerus, the femur, and the distal clavicle. For depictions of these sites, see the images below. When the resorption extends to the margins of joints, particularly in the hands, wrists, and feet, findings may appear articular. Anteroposterior radiographic view of the left shoulder in external rotation in a patient with primary hyperparathyroidism. 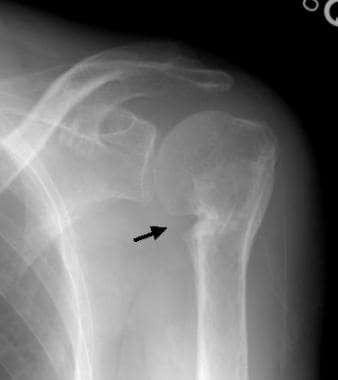 This image shows the healing stage of marked subperiosteal resorption (arrow) of the medial aspect of the proximal humerus. Radiograph of the proximal humerus in a patient with primary hyperparathyroidism (same patient as in the previous image). 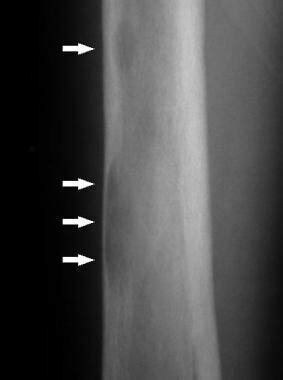 This image shows the healing stage of marked subperiosteal resorption of the medial aspect of the proximal humerus. A subsequent fracture through the surgical neck of the humerus is also depicted. Radiograph of the distal femur in a patient with primary hyperparathyroidism. This image shows scalloped defects along the inner margin of the cortex, which denote endosteal resorption. Radiograph of the femur in primary hyperparathyroidism (same patient as in the previous image). This image shows scalloped defects along the inner margin of the femoral cortex (arrows), which denote endosteal resorption. 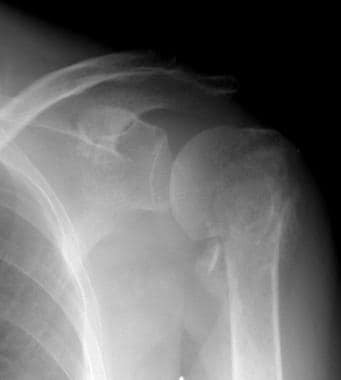 Radiograph of the shoulder in a patient with primary hyperparathyroidism. 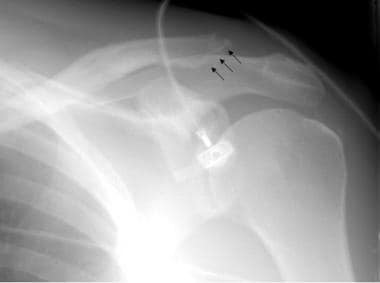 This image depicts subperiosteal distal clavicular resorption (arrows). 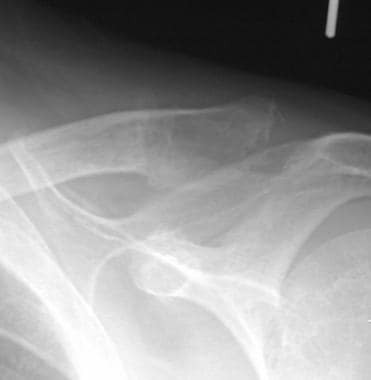 Radiograph of the shoulder in a patient with primary hyperparathyroidism. This image demonstrates distal clavicular resorption. Other areas of resorption, such as cortical or endosteal regions, are usually accompanied by subperiosteal findings. Intracortical bone resorption is an indicator of rapid bone turnover and is described as linearly oriented striations in the cortex. The linear lucencies are produced by resorption of bone in the haversian canals and are best seen on the cortical surface of the second metacarpal. Trabecular bone resorption may occur throughout the skeleton and usually accompanies advanced disease. In the skull, areas of decreased radiopacity are intermingled with sclerotic radiopaque areas, resulting in a classic appearance called the salt-and-pepper skull (see the image below). Anteroposterior radiographic view of the top of the calvarium in a patient with primary hyperparathyroidism. This image shows trabecular bone resorption that has resulted in the salt-and-pepper appearance of the calvarium. In endosteal resorption, the medullary cavity widens, with thinning of the inner cortex (see the images below). Changes are usually best seen in the hands and appear as scalloped lucencies on the inner aspect of the bony cortex. Endosteal changes are usually accompanied by subperiosteal or cortical resorption. Subchondral bone resorption is most common in the joints of the axial skeleton, such as the sacroiliac, acromioclavicular (see the image below) discovertebral, sternoclavicular, and symphysis pubis, but it may also occur in the joints of the appendicular skeleton. Subchondral bone is resorbed; collapse with subsequent new bone formation and fibrous replacement may result. Anteroposterior radiographic view of the clavicles. This image shows symmetric subchondral bone resorption of the acromioclavicular joints. Distal clavicular resorption can be subperiosteal or subchondral, but this finding is not specific for primary hyperparathyroidism. On radiographs, areas of subchondral lucency are noted with surrounding sclerosis. In the sacroiliac joint, bilateral findings affect the ilium more than the sacrum and may produce an irregular articular margin with the appearance of a widened joint. At the acromioclavicular joint, bilateral erosions affect the clavicle side more than the acromion, whereas the sternum and clavicle are equally affected at the sternoclavicular joint. Subligamentous and subtendinous resorption occurs at insertion sites on bones. Common sites are the plantar aspect of the calcaneus, dorsal aspect of the patella, inferior margin of the distal clavicle, trochanters, and ischial and humeral tuberosities. Brown tumors are well-circumscribed lytic lesions of bone that represent the osteoclastic resorption of a confluent area of bone with subsequent fibrous replacement (see the images below). The lesions may be single or multiple, with expansion of overlying bone, and they may be present in any site, although the lesions usually occur in cortical bone. Common sites include the mandible, clavicle, ribs, pelvis, and femur. Radiograph of the humerus in a patient with primary hyperparathyroidism. This image depicts a brown tumor. Note the osseous expansion and lucency of the proximal humerus. Brown tumors can have varied appearances. Radiograph of the mid femoral diaphysis in a patient with primary hyperparathyroidism. This image depicts brown tumors. Note the eccentric (arrowheads) and central positions (arrow) of the lesions. 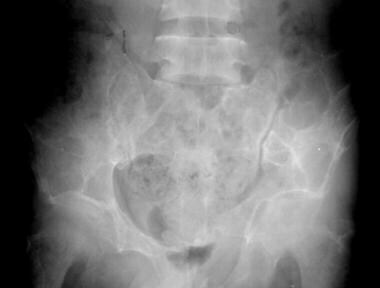 Radiograph of the pelvis in a patient with primary hyperparathyroidism. Note the presence of brown tumors in the pelvis. Radiograph of brown tumors of the pelvis in a patient with primary hyperparathyroidism (same patient as in the previous image). After resection of an adenoma, lesions may become sclerotic on radiographs. Once considered a finding that was characteristic of primary hyperparathyroidism, brown tumors are more common in secondary hyperparathyroidism because of the increasing population and life expectancy of patients undergoing dialysis. Calcium pyrophosphate dihydrate crystal deposition disease (CPPD) is more common in association with primary hyperparathyroidism than with secondary hyperparathyroidism. Chondrocalcinosis may affect the menisci of the knee, the triangular cartilage of the wrist, and the symphysis pubis. CPPD arthropathy is less common in these patients than in patients with idiopathic disease. Other radiographic findings in primary hyperparathyroidism include varying degrees of sclerosis, although generalized sclerosis is more common in secondary hyperparathyroidism. Soft-tissue and vascular calcification is more common in secondary disease, as is superior and inferior band sclerosis of the spine, which is called rugger-jersey spine. The laxity of ligaments and tendons primarily affects the sacroiliac and acromioclavicular joints, whereas rupture may be seen at several sites, including the quadriceps, triceps, and patellar tendons. In the setting of elevated serum calcium levels and elevated PTH levels, the diagnosis of primary hyperparathyroidism is certain. However, radiographic findings of subperiosteal resorption are most specific for the disease and should prompt consideration of the primary hyperparathyroidism. Technetium-99m sestamibi scan (99mTc MIBI) in a patient with multiple endocrine neoplasia syndrome type 1 (MEN 1). This image demonstrates persistent abnormal activity of the inferior right parathyroid gland that is consistent with an adenoma. Sagittal (left image) and coronal (right image) T1-weighted magnetic resonance images of the brain in a patient with multiple endocrine neoplasia syndrome type 1 (MEN 1) (same patient as in the previous image). These images show a pituitary macroadenoma (arrows). MRI findings of brown tumors are nonspecific. Bony expansion can be visualized, and the extent of the lesion can be determined. The imaging characteristics depend on the amount of fibrous tissue, hemorrhage, and cystic changes that are present in the lesion. Lack of an associated soft-tissue mass is a pertinent negative finding that can be demonstrated on MRIs. Ultrasonography is one of the primary modalities used to localize parathyroid tumors. [28, 29] The size of the adenoma is usually correlated with the degree of parathyroid elevation. Adenomas appear as well-defined hypoechoic lesions with potential cystic or necrotic areas. Ultrasonography offers the advantage of depicting potential concomitant thyroid disease, which is present in approximately 40% of patients with parathyroid disease. Ultrasonography is approximately 75% sensitive in identifying adenomas, but this technique has low sensitivity in identifying ectopic lesions. In renal imaging, ultrasonography can demonstrate bilateral hyperechoic medullary pyramids that are consistent with medullary nephrocalcinosis; this is a nonspecific finding (see the image below). 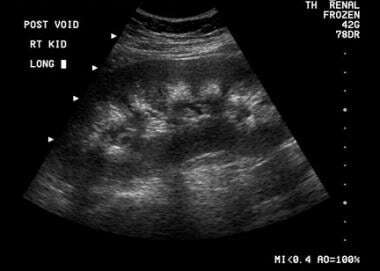 Sonogram of the kidney in a patient with primary hyperparathyroidism. 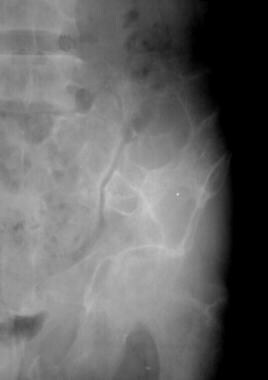 This image shows medullary nephrocalcinosis. Technetium-99m sestamibi (99mTc MIBI) images in a patient with primary hyperparathyroidism. The initial (A) and 3.5-hour delayed (B) images demonstrate a 6-cm parathyroid adenoma (arrows). In musculoskeletal imaging, bone densitometry is extremely valuable in assessing primary hyperparathyroidism because it can be used to quantify bone loss, and it may help making predictions regarding the fracture risk (see also the Fracture Index WITH known Bone Mineral Density [BMD] calculator). DXA helps in evaluating the mineral content of all bone in the path of the beam. Bone mineral density is expressed as either a T score, which is based on the standard deviations from a young-adult mean, or as a Z score, which is compared with an age-matched mean. The T score is used to clinically diagnose osteopenia or osteoporosis and to predict the fracture risk. DXA may also be used after an intervention to document improvements in bone density. The diagnosis of primary hyperparathyroidism is based on biochemical determinations, and bone scanning has a limited role in making the diagnosis. In addition, a few patients with hyperparathyroidism have insufficient disease for its demonstration on bone scans. However, bone scanning may assist in differentiating hyperparathyroidism from metastatic disease in the setting of elevated calcium levels. Because bone turns over significantly in hyperparathyroidism, findings on bone scans include generalized increased radionuclide uptake throughout the skeleton in contrast to soft tissues; this observation is called a superscan. Because the contrast of the skeletal system is increased, renal activity may not be apparent. With parathyroid imaging, ectopic adenomas can be assessed by using contrast-enhanced CT scan studies. However, sestamibi and MRI are more sensitive, and these are the imaging studies of choice in most patients (see the images below). In musculoskeletal imaging, QCT scanning is another method of bone densitometry. This modality offers the advantage of selective evaluation of the mineral content in trabecular bone, which makes QCT scanning more sensitive in detecting small changes in bone density. Computed tomography (CT) scan of the pancreas in a patient with multiple endocrine neoplasia syndrome type 1 (MEN 1) and a gastrinoma (same patient as in the previous 2 images). 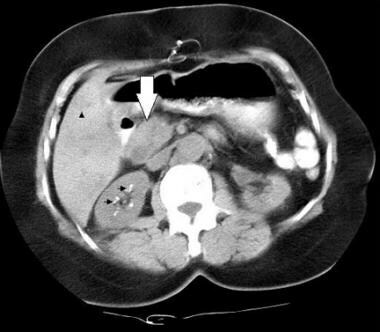 This image shows a pancreatic head mass (large white arrow), as well as a low-attenuating lesion in the liver (small black arrowhead) that indicates metastases. Note the calcifications of the right renal medullary pyramids (medullary nephrocalcinosis; black arrows) in this nonenhanced CT scan. Bilezikian JP, Cusano NE, Khan AA, Liu JM, Marcocci C, Bandeira F. Primary hyperparathyroidism. Nat Rev Dis Primers. 2016 May 19. 2:16033. [Medline]. Liddy S, Worsley D, Torreggiani W, Feeney J. Preoperative Imaging in Primary Hyperparathyroidism: Literature Review and Recommendations. Can Assoc Radiol J. 2017 Feb. 68 (1):47-55. [Medline]. Rodgers SE, Lew JI, Solórzano CC. Primary hyperparathyroidism. Curr Opin Oncol. 2008 Jan. 20(1):52-8. [Medline]. Albright F, Aub JC, Bauer W. Hyperparathyroidism, a common and polymorphic condition as illustrated by seventeen proved cases from one clinic. JAMA. 1934. 102:1276-87. Albright F, Reifenstein EC Jr. Clinical hyperparathyroidism. Albright F, Reifenstein EC Jr, eds. The Parathyroid Glands and Metabolic Bone Disease: Selected Studies. Baltimore, Md: Williams & Wilkins; 1948. 46-134. Mihai R, Wass JA, Sadler GP. Asymptomatic hyperparathyroidism--need for multicentre studies. Clin Endocrinol (Oxf). 2008 Feb. 68(2):155-64. [Medline]. Mayo-Smith W, Rosenthal DI. 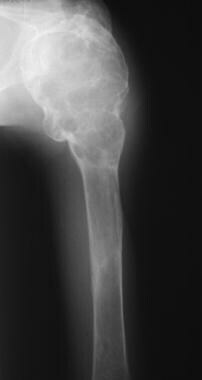 Radiographic appearance of osteopenia. Radiol Clin North Am. 1991 Jan. 29(1):37-47. [Medline]. Reynolds WA, Karo JJ. Radiologic diagnosis of metabolic bone disease. Orthop Clin North Am. 1972 Nov. 3(3):521-43. [Medline]. Pugh DG. Subperiosteal resorption of bone; a roentgenologic manifestation of primary hyperparathyroidism and renal osteodystrophy. Am J Roentgenol Radium Ther Nucl Med. 1951 Oct. 66(4):577-86. [Medline]. Erbil Y, Kapran Y, Issever H, et al. The positive effect of adenoma weight and oxyphil cell content on preoperative localization with 99mTc-sestamibi scanning for primary hyperparathyroidism. Am J Surg. 2008 Jan. 195(1):34-9. [Medline]. Gupta Y, Ahmed R, Happerfield L, et al. P-glycoprotein expression is associated with sestamibi washout in primary hyperparathyroidism. Br J Surg. 2007 Dec. 94(12):1491-5. [Medline]. Carlier T, Oudoux A, Mirallié E, et al. (99m)Tc-MIBI pinhole SPECT in primary hyperparathyroidism: comparison with conventional SPECT, planar scintigraphy and ultrasonography. Eur J Nucl Med Mol Imaging. 2007 Oct 25. epub ahead of print. [Medline]. Siegel A, Mancuso M, Seltzer M. The spectrum of positive scan patterns in parathyroid scintigraphy. Clin Nucl Med. 2007 Oct. 32(10):770-4. [Medline]. Gotway MB, Reddy GP, Webb WR, et al. Comparison between MR imaging and 99mTc MIBI scintigraphy in the evaluation of recurrent of persistent hyperparathyroidism. Radiology. 2001 Mar. 218(3):783-90. [Medline]. [Full Text]. Thomas DL, Bartel T, Menda Y, Howe J, Graham MM, Juweid ME. Single photon emission computed tomography (SPECT) should be routinely performed for the detection of parathyroid abnormalities utilizing technetium-99m sestamibi parathyroid scintigraphy. Clin Nucl Med. 2009 Oct. 34(10):651-5. [Medline]. Krakauer M, Wieslander B, Myschetzky PS, Lundstrøm A, Bacher T, Sørensen CH, et al. A Prospective Comparative Study of Parathyroid Dual-Phase Scintigraphy, Dual-Isotope Subtraction Scintigraphy, 4D-CT, and Ultrasonography in Primary Hyperparathyroidism. Clin Nucl Med. 2015 Oct 8. [Medline]. Hindie E, Zanotti-Fregonara P, Tabarin A, Rubello D, Morelec I, Wagner T, et al. The role of radionuclide imaging in the surgical management of primary hyperparathyroidism. J Nucl Med. 2015 May. 56 (5):737-44. [Medline]. Ryhanen EM, Schildt J, Heiskanen I, Väisänen M, Ahonen A, Löyttyniemi E, et al. (99m)Technetium Sestamibi-(123)Iodine Scintigraphy Is More Accurate Than (99m)Technetium Sestamibi Alone before Surgery for Primary Hyperparathyroidism. Int J Mol Imaging. 2015. 2015:391625. [Medline]. Gritzmann N, Koischwitz D, Rettenbacher T. Sonography of the thyroid and parathyroid glands. Radiol Clin North Am. 2000 Sep. 38(5):1131-45, xii. [Medline]. Coelho MC, de Oliveira E Silva de Morais NA, Beuren AC, Lopes CB, Santos CV, Cantoni J, et al. ROLE OF IMAGING TESTS FOR PREOPERATIVE LOCATION OF PATHOLOGIC PARATHYROID TISSUE IN PATIENTS WITH PRIMARY HYPERPARATHYROIDISM. Endocr Pract. 2016 Sep. 22 (9):1062-7. [Medline]. Agha A, Hornung M, Schlitt HJ, Stroszczynski C, Jung EM. The role of contrast-enhancend ultrasonography (CEUS) in comparison with 99mTechnetium-sestamibi scintigraphy for localization diagnostic of primary hyperparathyroidism. Clin Hemorheol Microcirc. 2014. 58 (4):515-20. [Medline]. Kluijfhout WP, Pasternak JD, Gosnell JE, Shen WT, Duh QY, Vriens MR, et al. F18 Fluorocholine PET/MR Imaging in Patients with Primary Hyperparathyroidism and Inconclusive Conventional Imaging: A Prospective Pilot Study. Radiology. 2017 Jan 25. 160768. [Medline]. Wilhelm SM, Wang TS, Ruan DT, Lee JA, Asa SL, Duh QY, et al. The American Association of Endocrine Surgeons Guidelines for Definitive Management of Primary Hyperparathyroidism. JAMA Surg. 2016 Oct 1. 151 (10):959-968. [Medline]. Gahier Penhoat M, Drui D, Ansquer C, Mirallie E, Maugars Y, Guillot P. Contribution of 18-FDG PET/CT to brown tumor detection in a patient with primary hyperparathyroidism. Joint Bone Spine. 2016 Oct 7. [Medline]. Martínez-Rodríguez I, Martínez-Amador N, de Arcocha-Torres M, Quirce R, Ortega-Nava F, Ibáñez-Bravo S, et al. Comparison of 99mTc-sestamibi and 11C-methionine PET/CT in the localization of parathyroid adenomas in primary hyperparathyroidism. Rev Esp Med Nucl Imagen Mol. 2013 Oct 11. [Medline]. Griffith B, Chaudhary H, Mahmood G, Carlin AM, Peterson E, Singer M, et al. Accuracy of 2-Phase Parathyroid CT for the Preoperative Localization of Parathyroid Adenomas in Primary Hyperparathyroidism. AJNR Am J Neuroradiol. 2015 Sep 10. [Medline]. Tee MC, Chan SK, Nguyen V, Strugnell SS, Yang J, Jones S, et al. Incremental value and clinical impact of neck sonography for primary hyperparathyroidism: a risk-adjusted analysis. Can J Surg. 2013 Oct. 56(5):325-31. [Medline]. [Full Text]. Hoda NE, Phillips P, Ahmed N. Recommendations after non-localizing sestamibi and ultrasound scans in primary hyperparathyroid disease: order more scans or explore surgically?. J Miss State Med Assoc. 2013 Feb. 54(2):36-41. [Medline]. Shafiei B, Hoseinzadeh S, Fotouhi F, Malek H, Azizi F, Jahed A, et al. Preoperative 99mTc-sestamibi scintigraphy in patients with primary hyperparathyroidism and concomitant nodular goiter: comparison of SPECT-CT, SPECT, and planar imaging. Nucl Med Commun. 2012 Oct. 33(10):1070-6. [Medline]. Opoku-Boateng A, Bolton JS, Corsetti R, Brown RE, Oxner C, Fuhrman GM. Use of a sestamibi-only approach to routine minimally invasive parathyroidectomy. Am Surg. 2013 Aug. 79(8):797-801. [Medline]. Kukar M, Platz TA, Schaffner TJ, Elmarzouky R, Groman A, Kumar S, et al. The use of modified four-dimensional computed tomography in patients with primary hyperparathyroidism: an argument for the abandonment of routine sestamibi single-positron emission computed tomography (SPECT). Ann Surg Oncol. 2015 Jan. 22 (1):139-45. [Medline]. Starker LF, Mahajan A, Björklund P, Sze G, Udelsman R, Carling T. 4D parathyroid CT as the initial localization study for patients with de novo primary hyperparathyroidism. Ann Surg Oncol. 2011 Jun. 18 (6):1723-8. [Medline]. Lubitz CC, Hunter GJ, Hamberg LM, Parangi S, Ruan D, Gawande A, et al. Accuracy of 4-dimensional computed tomography in poorly localized patients with primary hyperparathyroidism. Surgery. 2010 Dec. 148 (6):1129-37; discussion 1137-8. [Medline]. Suh YJ, Choi JY, Kim SJ, Chun IK, Yun TJ, Lee KE, et al. Comparison of 4D CT, ultrasonography, and 99mTc sestamibi SPECT/CT in localizing single-gland primary hyperparathyroidism. Otolaryngol Head Neck Surg. 2015 Mar. 152 (3):438-43. [Medline]. Sandqvist P, Nilsson IL, Grybäck P, Sanchez-Crespo A, Sundin A. SPECT/CT's Advantage for Preoperative Localization of Small Parathyroid Adenomas in Primary Hyperparathyroidism. Clin Nucl Med. 2017 Feb. 42 (2):e109-e114. [Medline]. García-Talavera P, Díaz-Soto G, Montes AA, Villanueva JG, Cobo A, Gamazo C, et al. Contribution of early SPECT/CT to 99mTc-MIBI double phase scintigraphy in primary hyperparathyroidism: Diagnostic value and correlation between uptake and biological parameters. Rev Esp Med Nucl Imagen Mol. 2016 Nov - Dec. 35 (6):351-357. [Medline]. Witteveen JE, Kievit J, Stokkel MP, Morreau H, Romijn JA, Hamdy NA. Limitations of Tc99m-MIBI-SPECT imaging scans in persistent primary hyperparathyroidism. World J Surg. 2011 Jan. 35 (1):128-39. [Medline]. Silverberg SJ. Natural history of primary hyperparathyroidism. Endocrinol Metab Clin North Am. 2000 Sep. 29(3):451-64. [Medline]. Marx SJ. Hyperparathyroid and hypoparathyroid disorders. N Engl J Med. 2000 Dec 21. 343(25):1863-75. [Medline]. Bringhurst FR, Demay MB, Kronenberg HM. Hormones and disorders of mineral metabolism. Williams RH, Foster DW, Kronenberg HM, Larsen PR, eds. Williams Textbook of Endocrinology. 9th ed. Orlando, Fla: Harcourt Brace & Co; 1998. 1172-80. Lenchik L, Sartoris DJ. Orthopedic aspects of metabolic bone disease. Orthop Clin North Am. 1998 Jan. 29(1):103-34. [Medline]. Cotran RS, Kumar V, Robbins SL. Robbins Pathologic Basis of Disease. 5th ed. Philadelphia, Pa: WB Saunders Co; 1994. 1144-6. Mankin HJ. Metabolic bone disease. J Bone Joint Surg. 1994. 76-A:760-88. [Full Text]. Hayes CW, Conway WF. Hyperparathyroidism. Radiol Clin North Am. 1991 Jan. 29(1):85-96. [Medline]. Resnick D, Niwayama G. Parathyroid disorders and renal osteodystrophy. Resnick D, Niwayama G, eds. Diagnosis of Bone and Joint Disorders. 2nd ed. Philadelphia, Pa: WB Saunders Co; 1988. 2219-49. Genant HK. Quantitative bone mineral analysis. Resnick D, Niwayama G, eds. Diagnosis of Bone and Joint Disorders. 2nd ed. Philadelphia, Pa: WB Saunders Co; 1988. 2006-17. Gleason DC, Potchen EJ. The diagnosis of hyperparathyroidism. Radiol Clin North Am. 1967 Aug. 5(2):277-87. [Medline]. Inoue Y, Kaji H, Hisa I, et al. Vitamin D status affects osteopenia in postmenopausal patients with primary hyperparathyroidism. Endocr J. 2008 Jan 10. epub ahead of print. [Medline]. [Full Text]. Moosgaard B, Christensen SE, Vestergaard P, et al. Vitamin D metabolites and skeletal consequences in primary hyperparathyroidism. Clin Endocrinol (Oxf). 2008 Jan 8. epub ahead of print. [Medline]. Fogelman I, Cook GJ. Scintigraphy in metabolic bone disease. Favus MJ, Goldring SR, Christakos S, eds. Primer on the Metabolic Bone Diseases and Disorders of Mineral Metabolism. 4th ed. Hagerstown, Md: Lippincott Williams & Wilkins; 1999. 150-2. Jergas MD, Genant HK. Radiology of osteoporosis. Favus MJ, Goldring SR, Christakos S, eds. Primer on the Metabolic Bone Diseases and Disorders of Mineral Metabolism. 4th ed. Hagerstown, Md: Lippincott Williams & Wilkins; 1999. 160-5. Prasannan S, Davies G, Bochner M, Kollias J, Malycha P. Minimally invasive parathyroidectomy using surgeon-performed ultrasound and sestamibi. ANZ J Surg. 2007 Sep. 77(9):774-7. [Medline]. Indium-111 (111In) octreotide scan in a patient with multiple endocrine neoplasia syndrome type 1 (MEN 1) (same patient as in the previous 3 images). These nuclear images demonstrate abnormal activity in the pituitary macroadenoma (curved arrow), parathyroid adenoma (straight arrow), and gastrinoma metastases throughout the abdomen (arrowheads).